mammagranate: What happens at the beach stays at the beach! When we showed up to the Beach House for our vacation, my sister-in-law Dara--the one that made this awesome cake for Easter--had a bag of goodies for Anna and Addie. The bag was an adorable Hello Kitty tote. In it were Hello Kitty candy necklaces, Hello Kitty ring pops, Hello Kitty scented baby wipes, beaded bracelets, and a Hello Kitty sand jar kit. The girls were psyched. 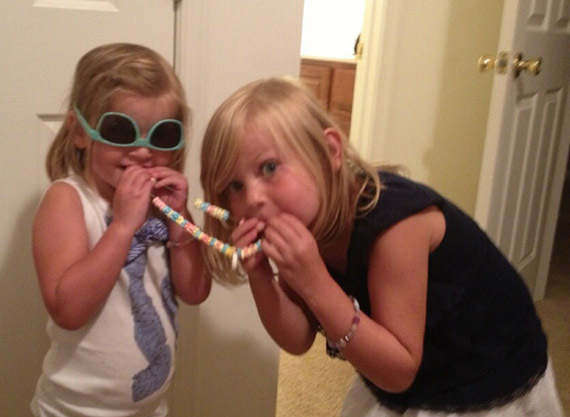 They cracked open the candy necklaces before I could say, "Wait! We're just about to eat dinner." I didn't sweat it though. When our family vacations, we have a special tradition to let the kids eat special foods that we normally don't buy. They know that these foods are special vacation foods and are not to ask for them when we get back home. One of the things we get them is these juice boxes. The funny thing is Honest Kids Juice boxes seem like good old Capri suns, but they are actually watered down. Just take a look at the ingredient list: it is water. Yay! The second food that we buy them is a junk cereal of their choice. This week they picked Lucky Charms. It's funny how making little concessions on junk food for vacation is really a big deal to them. The best part--in my opinion--is that it teaches them an important lesson that some things that we eat are foods that should only be eaten some times. I like this terminology because it is simple; the concept is easy for little ones to understand.